These website terms are for a business that provides software as a service (SaaS) or any other technical IT service provided online for a defined time period or with a set outcome or number of uses, after which a customer must order again. 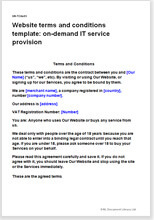 The document is suitable for selling to businesses or consumers. Examples of services that could be sold using this template include tests and one-off access to web based software or games. Here is your website T&C for a technical business providing a software “product” which can be performed as a web service for a retail or business client. Perfect for a “cloud” service. Examples: gaming, betting, personality tests, grammar check, medical diagnostics. We have assumed that users interface with your website and that you therefore require tough and extensive protection of your intellectual property, your website and security. We also provide a comprehensive menu of items you will probably use to regulate what your users are permitted to upload. The document does not try to describe what you actually do or offer for sale. That will be detail for you to make clear on your website. We have given you options in many areas, each in simple terms so that you can choose exactly what you want without having to put legal words together. This template complies with the Fair Trading Act 1986, the Consumer Guarantees Act 1993 as amended, and other latest consumer protection legislation allowing you to sell to businesses or consumers. Over 2,000 words of helpful and informative drafting notes.